Being able to communicate with your dog is something that’s important for all pet owners. Not only do you want your dog to listen to you when you call him or ask him to sit or lay down, but you also want to understand what your dog is trying to tell you through his own doggy language. Dogs communicate both verbally and non-verbally. They let us know when they’re hungry, when they want to go outside and when they want attention. Most dog owners know that a happy dog will wag his tail, and a barking dog is warning us that he sees or hears something unfamiliar. 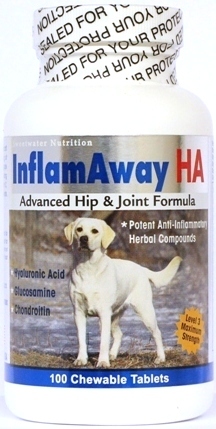 Looking for pain relief without damaging NSAIDs for your Dog? But did you know there are lots of other ways that dogs communicate? Dogs use their eyes, ears, tail and body posture to express their thoughts and feelings. Of course, every dog is different and each dog has their own unique way of communicating. But there are still lots of common signals that dogs will use to tell us what’s going on. By carefully watching your dog and knowing what these different signs mean, you’ll soon have a better understanding of what your dog is trying to tell you. You can tell a lot about your dog’s state of mind just by looking at his eyes and face. Your dog probably has either round or almond shaped eyes – when your dog is calm and relaxed, the natural shape of his eyes will remain the same. You might notice that your dog will squint a little bit when he’s really relaxed, but overall the shape of his eyes will not change when he’s relaxed. However, if your dog is excited or something surprises him, his eyes will quickly become wide and round. His pupils will rapidly dilate, and they may even appear “glassy.” You might also see some of the white part of his eye (the sclera) depending on the situation. Something else you’ll want to pay attention to is the position of your dog’s eyes. If your dog is looking directly at you and his facial expression is relaxed, then he’s letting you know that he’s being approachable and friendly. The message is a little different, however, if your dog makes eye contact with you and then breaks his contact by either looking away or looking down. This is his way of telling you (or another dog) that he’s feeling submissive and doesn’t want any trouble. Alternately, you’ll need to pay close attention to your dog if he’s staring at you from the corner of his eyes and the whites of his eyes are showing. Your dog will also probably have a tense facial expression and rigid body posture at the same time. This means that he’s telling you that he’s not happy and does not want to be messed with. Some dogs will do this when they’re guarding their food or protecting their favorite toy. Depending on the individual dog or the situation, this could potentially lead to an aggressive outburst if you don’t pay attention to this warning. 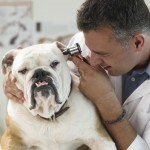 You can also understand what your dog is trying to tell you by paying attention to the position of his ears. Depending on the breed, your dog could have long floppy ears, short round ears or triangular upright ears. You’ll want to focus on the base of your dog’s ears (where they connect to his head). This is the part of his ear that your dog moves in order to express his different emotions. Your dog’s ears will stay in their natural position when he’s feeling relaxed. But if he becomes curious or alert, he’ll raise his ears higher on his head. At the same time, he’ll also move his ears in the direction of whatever it is that got his attention. His forehead will become slightly wrinkled, and he might even turn his head slightly to the side. If your dog’s ears are pulled back just a little bit, this means that he’s trying to be friendly. But if your dog’s ears are completely flat and pinned back, he’s telling you that he’s concerned, frightened or possibly feeling submissive. It’s important to pay attention to your dog’s ears for communication signals. But it can be deceiving to tell how your dog is feeling just by looking at his ears alone. His ears may be pointed towards you at first, but then he’ll hear a sound in the distance that gets his attention. He’ll quickly move one or both ears towards the direction of that sound. And then in a flash, his ears could be right back listening to you. You’ll need to look at the whole picture (not just the ears) to better understand what your dog is trying to tell you. Your dog uses his mouth quite a bit to let you know when he’s happy, relaxed or stressed. Your dog will typically keep his mouth either completely closed or just slightly open when he’s feeling calm and relaxed. The corners of his lips might turn up a little bit, and there won’t be any tension in his mouth or face. If your dog feels stressed or gets nervous, his mouth will become tense and he’ll keep it tightly closed. He might also pull his lips back slightly at the corners of his mouth. Your dog could even yawn or repeatedly lick his lips in reaction to the stress. Some dogs will also pant or whine – this is another way that your dog is letting you know that he’s upset. Shedding Excessively? Dry Itchy Skin? If your dog feels threatened or scared, he’ll probably pull back his lips tightly to expose his teeth. He’ll wrinkle the top of his muzzle, and his forehead will also look tense. At the same time, his eyes will become large, his pupils will be dilated, and there could be a lot of white showing around his eyes. There’s also a good chance that your dog will growl as an additional sign to let you know that he’s scared or feeling threatened. Dogs will usually warn you well in advance when they don’t want you to come any closer to them. So it’s important to pay attention and understand when your dog is telling you this. If you ignore these initial warning signs, there’s a chance your dog could become even more agitated and possibly even bite. Some dogs will “submissively grin,” which many people mistakenly interpret as a sign of aggression or an attempt to bite. It’s more common among certain breeds, and if your dog does this, it’ll look like your dog is trying to smile at you. Your dog will pull up his lips and show his front teeth (canines and incisors) which initially looks aggressive. But if you look at the rest of your dog’s body posture, he’s communicating the exact opposite. Your dog’s body will be relaxed, his eyes are soft and squinted, and he’s probably also wagging his tail. This is your dog’s way of telling you that he’s feeling submissive, not aggressive. Your dog frequently uses his tail to communicate how he’s feeling. He moves his tail not only when he’s happy, but also when he’s excited or scared. Since dogs have different size tails (some are long, some are short, some are curled), you’ll need to look at the base of your dog’s tail where it connects to his body to see what he’s trying to tell you. You’ll also want to pay attention to how he’s moving his tail. That, too, will tell you a lot about your dog’s state of mind. When your dog is relaxed, he’ll keep his tail in a neutral position. If your dog is happy, he’ll wag his tail from side to side, though some dogs will wag their tail in a circular motion. The happier your dog is feeling, the faster he’s going to wag his tail. And the more excited your dog becomes, he’ll wag his tail even faster and hold it up higher at the same time. If your dog is wagging his tail, but it’s a low, fast wag, this usually means that he’s happy, but he’s also nervous at the same time (like a nervous laugh in people). When your dog is alert and concerned about something, he’ll typically hold his tail up higher than he usually does. He might even keep his tail completely still. If your dog is holding his tail high and moves it stiffly back and forth (called “flagging”), this means that he’s trying to stand his ground and is taking a threatening posture. It might appear that he’s wagging his tail to be friendly, but the rest of his body will be rigid and tight. This is his way of letting you know that he’s not being friendly at that moment. Finally, if your dog is scared, he’ll probably tuck his tail between his hind legs and hold it tightly against his belly. Some dogs naturally keep their tail in a relaxed position between their legs, such as greyhounds or whippets. But you can tell that your dog is scared if his tail is tightly tucked under his legs as opposed to keeping it loose and relaxed. Very similar to how people get goosebumps, your dog’s hair will raise on the top of his back when he gets excited or upset. Your dog’s hair probably already sticks up a little bit between his shoulder blades when he’s calm. But when he’s afraid, angry or excited about something, his hair will stick straight up across his shoulders, down his spine and above his tail. Also, if your dog is scared or stressed, he will suddenly start to shed a lot more than he usually does. You’ve probably seen this when you take your dog to the vet. As soon as you walk into the vet’s office, your dog will start shedding. And by the time the exam is over, there will be dog hair completely covering you, the vet and the exam table. This is your dog’s way of telling you that he’s nervous and stressed. Shedding is normal for all dogs, and your dog probably sheds occasionally when he’s home and relaxed. If your dog is not stressed and he’s shedding a lot more than normal, he might have dry, itchy skin and you probably should give your dog a skin and coat supplement. Dogs also use their bodies to express their emotional state. By looking at how your dog is standing and how he moves, you’ll be able to get a clearer idea as to what your dog is trying to tell you. When your dog is happy and relaxed, his face and body muscles will also be relaxed. His weight will be evenly placed on all four feet and his overall appearance will be soft. It’s entirely different if your dog is feeling scared or threatened. He’ll lower his body or cower on the ground and will keep his head down at the same time. He may decide to lean against you for comfort (like at the vet’s office). Or he could decide it’s better just to run away from the scary situation. He might try to approach whatever is frightening him if he’s feeling brave at the time, but he’ll keep his weight on his hind legs. That way he can retreat quickly if he needs to. Quite differently, if your dog is angry or feeling aggressive, he’s going to try to make himself look large and intimidating. He’ll immediately stand tall and his muscles will be tight and tense. His neck and head will be raised up high and he’ll probably have his weight on his front feet so he can lunge forward if he needs to. Dogs are very honest with their body signals, and you can learn a lot about what your dog is thinking and feeling by watching how he looks, acts and moves. By looking at the overall picture of your dog’s behavior and body language, you’ll have a better understanding of what your dog is trying to tell you. What are some things that your dog does to try to convey his feelings and actions? My dog will sit in front of me and stare straight at me ears up. Or. She gets up in the recliner with me and presses her head and neck into my chest with her neck and side. And if I ignore her she talks to me is the only way I can describe It. When my dog is very excited like when I come home he makes “ talking “ sounds. My dog actually learned to say hello. It happened because we tell him hello when we come home. Then one day he said hello back.